G-FX TR-14 and TR-16 are now available for order! Backed with a lifetime structural warranty and 1-year finish warranty, G-FX wheels meet the needs of the enthusiast both off-road and on-road. For the enthusiast that prefers spoke design, the TR-14 is an 8-spoke design that utilizes a matte black center with a grey trim ring finish. Available in 17-inch through 20-inch sizes, the TR-16 features a bolt-on center caps and machined rivets on the trim ring. 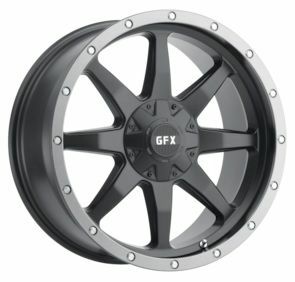 With classic modular wheel styling in matte black and polished finish, the G-FX TR-16 features a push through center cap and is available in popular 15-inch through 18-inch sizes. See the TR-14 and TR-16 on your vehicle!